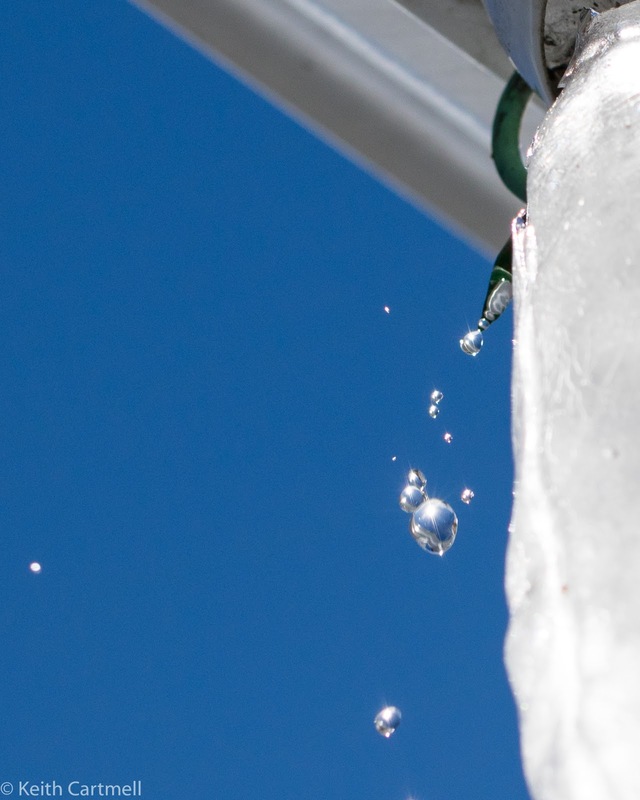 The intent at the time was to catch the light coming off the ice on the rain chain. I was hoping to get a rainbow effect with the light diffracting through the bits of ice. I've got almost 2 dozen attempts and none of them worked out for that. However, one, just one, had something else interesting. After a bit of tweaking you get this. At least I didn't get any water on the lens or camera. That's what I was worried about most. I think I'll try this shot again next warm and sunny day. I'd like to catch the drop round enough and sharp enough to see my reflection in it. One again we had the furnace guy out. One of the fans has been making more and more noise. Sort of a buzzing growl. We hadn't realized just how loud it had become till some guests were startled by it. Last night I slept like a rock in the peace and quiet. Maybe that's why I haven't been getting much sleep lately. Time to head down to Fish Creek for more photos.